Objectives: Fungal infections represent 5% of infections in renal transplant recipients. Candidiasis is the most frequent, followed by aspergillosis and cryptococcosis. Invasive aspergillosis is severe and has a poor prognosis, but recent series focused on outcomes are scarce in the literature. We analyzed invasive aspergillosis cases in a cohort of kidney transplant recipients and suggest that prognosis is improved with early diagnosis and treatment. Patients and Methods: A retrospective study was performed in all kidney transplant undertaken in our hospital from January 1979 to December 2012. The incidence and characteristics of invasive aspergillosis were collected from kidney transplant prospective registry and microbiology laboratory. Results: We found 7 invasive aspergillosis cases (6 probable invasive aspergillosis and 1 possible invasive aspergillosis, according to EORTC/IFICG criteria); cumulative incidence 0.78% (7/891). The median posttransplant time until the disease onset was 3.03 months (interquartile range, 2.4-3.2 months), with a mean age of 56 years at the time of diagnosis. Six patients were male. Four patients had previous pulmonary disease. Six patients had received induction therapy (5 anti-IL2R antibodies, 1 with antilymphocytic antibodies). Two patients had received extra immunosuppression (1 with thymoglobulin to treat an acute rejection and the other 1 had a lymphoproliferative disorder and was on chemotherapy). Six patients were on calcineurin inhibitors at the time of diagnosis. Aspergillus fumigatus was the specimen most commonly isolated (6 cases). Six patients had a bacterial coinfection and 1 had a cytomegalovirus coinfection. All patients were treated with antifungal agents; 3 of which received voriconazole. Four patients satisfactorily resolved the episode and 3 died. Conclusions: Invasive aspergillosis incidence is low in kidney transplant although potentially lethal. We observed an acceptable survival of patients analyzed, better than usually reported. A high index of suspicion is essential to get an early diagnosis and start treatment. The use of immunosuppressive agents represents an important predisposing factor for fungal infection, associated with induction therapy and maintenance, patients with multiple transplants with cumulative immunosuppression, and chronic allograft rejection with a consequent increase in immunosuppression, especially steroids. Other commonly related factors include broad-spectrum antibiotics, indwelling catheters, increasing numbers of surgical procedures, disruption of the intestinal or bladder mucosa, hyperglycemia, infection with cytomegalovirus, exposure to infective fungi, and chronic liver disease.7,8 Age, diabetes, and prolonged pretransplant dialysis also are reportedly influential in developing serious fungal infections.8 In addition to pretransplant dialysis, posttransplant dialysis because of renal impairment after transplant is a principal factor related to invasive aspergillosis.9 We aimed to analyze the incidence of invasive aspergillosis episodes, their characteristics, treatment, and outcomes, at our hospital. The 891 KT patients who received transplants in Hospital del Mar, Barcelona, Spain, between January 1979 to December 2012, where included in a prospective registry. Patient data collected included demographic, date of renal transplant, date of diagnosis (defined as the date the positive culture was collected), comorbid situations, immunosuppression regimen (induction and at the time of diagnosis), and concomitant bacterial or viral infections. Patients with a diagnosis of invasive aspergillosis were studied in detail. Invasive aspergillosis was defined according to criteria of the European Organization for Research and Treatment of Cancer/Invasive Fungal Infections Cooperative Group (EORTC/IFICG).10 Diagnosis of invasive aspergillosis was performed using sputum culture and bronchoalveolar isolation. Aspergillus galactomannan antigen was solicited only in 1 patient, and it was negative (Table 1, patient No. 5). Data pertaining to the invasive aspergillosis had been collected in this database, and a review of the record was undertaken when details were missing. No fungal prophylaxis was used in our patients. Only 2 patients had a ureteral stent at time of kidney transplant (Table 1, patient Nos. 6 and 7). Outcomes were analyzed retrospectively. Specific data analyzed included Aspergillus species (when identified), diagnostic tests, sites of invasive aspergillosis, history of antifungal therapy, changes in immuno-suppression, and therapeutic procedures. Day of diagnosis was considered as the day the first positive culture or pathology result was registered at the microbiology department or reported to the treating physician. The study was approved by the Ethical Review Committee of the institute. All protocols conformed with the ethical guidelines of the 1975 Helsinki Declaration. Seven cases of invasive aspergillosis were identified (6 “probable” cases and 1 “possible” case), resulting in the cumulative incidence being 7/891 (0.78%). The median time to the onset of infection was 3.03 months, and the interquartile range was 2.4 to 3.2 months. To calculate this median time we excluded 2 patients: a patient who presented a positive sputum culture the day after transplant (Table 1, patient No. 2) (that was probably a colonization related to his basal health status and a chronic pulmonary disease) who later developed an invasive pulmonary aspergillosis showed by computerized tomography (CT) images, with persistent Aspergillus positive sputum cultures; and a patient who presented with invasive aspergillosis 7 years after transplant, probably related to chemotherapy (Table 1, patient No. 4). The mean patient age was 56 years (range, 40-71 y). Six patients were men (86%). Four patients had pulmonary disease before the transplant (3 had chronic obstructive pulmonary disease and 1 had asthma). There were 2 diabetic patients, 1 was alcoholic and 1 had posttransplant lympho-proliferative disorder (PTLD) 7 years after the KT. Mean serum creatinine at the time of diagnosis was 264.32 ± 176.80 μmol/L (2.99 ± 2 mg/dL). One patient was on dialysis when he developed invasive aspergillosis (Table 1, patient No. 5). None of patients showed white blood cells count or a neutrophil count below the normal range at the time of invasive aspergillosis diagnosis. However, patient No. 6 had been treated 1 week before the onset of infection with granulocyte-colony stimulating factor because of neutropenia. Immunosuppression induction consisted of basiliximab (n=5), OKT3 (n=1), and 1 patient did not receive induction therapy. Maintenance immunosuppression at the time of diagnosis was based on calcineurin inhibitors in 6 patients. After diagnosis, 3 patients modified their immunosuppression regimen (Table 1). In addition to conventional immunosuppression for KT, patient No. 4 was receiving rituximab and a CHOP (cyclo-phosphamide, hydroxydaunorubicin, vincristine, prednisone) schedule of chemotherapy for the PTLD 7 years after transplant, and patient No. 6 was being treated with thymoglobulin because of a steroid-resistant cellular rejection 2 months after transplant. In terms of clinical presentation, all patients presented with invasive pulmonary aspergillosis. Radiologic features were mainly pulmonary patchy infiltrations shown by a thoracic CT scan (in detail in Table 1). Regarding the Aspergillus species, A. fumigatus was isolated in 6 patients (“probable invasive aspergillosis”), and 1 patient did not have any isolation (he was diagnosed by imaging tests and host factors). Six patients had a bacterial infection at the same time as the fungal infection (mainly pulmonary infections), and 1 of these patients was coinfected with cytomegalovirus. Six patients were on broad-spectrum antibiotics. Antifungal treatment was accomplished with amphotericin B in the 2 patients who had the disease diagnosed before 2000, caspofungin in the patient diagnosed in 2003, and voriconazole in the 3 patients diagnosed after 2007. One patient who was diagnosed in 2010 received only 1 day of treatment with anidulafungin before dying. The median duration of treatment was 29 days (interquartile range, 6-59 d). Four patients resolved the invasive fungal infection and 3 died. Patient No. 3 died because of intracranial hemorrhage; this patient received 8 days of treatment with caspofungin. Patient No. 4 had a PTLD and was on chemotherapy at the time of diagnosis. He died because of an abdominal septic process complicated with invasive aspergillosis. Data of his treatment for invasive aspergillosis were not available, as he had received several antifungal agents and the diagnosis was postmortem. Patient No. 6 died because of a cerebral hemorrhage 1 day after the treatment was initiated. She was on thymoglobulin treatment for an acute cellular rejection, and the diagnosis was late. 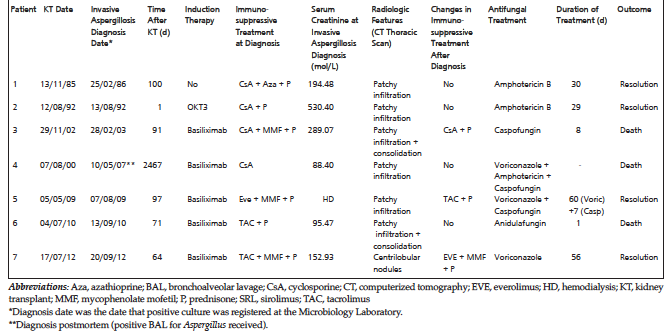 The cranial computed tomographic (CT) scan did not show any sign of invasive aspergillosis (see Table 1). In this study, we described our incidence of invasive aspergillosis (7 cases) in a cohort of KT patients (891) during the past 34 years. Although the incidence is low (0.78%), the severity of the disease (7 patients, 3 died) deserves merit. Risk factors for invasive aspergillosis are well known in liver and lung recipients, but not as well known in KT patients. Kidney function impairment and chronic allograft rejection (with an increase in immunosuppression) are related to early invasive aspergillosis (first 6 months) and late invasive aspergillosis.15 Within our patient cohort, only 3 patients had normal renal function at the time of diagnosis, with a serum creatinine less than 1.2 mg/dL. One patient had an acute steroid-resistant cellular rejection and was receiving thymoglobulin at the time of invasive aspergillosis, 2 months after transplant. Another patient was on chemotherapy plus rituximab because of a PTLD, and this over-immunosuppression was clearly related to the invasive aspergillosis episode 7 years after KT. Furthermore, bacterial coinfection is a frequent condition associated with fungal infections, more frequent in solid-organ transplant than in hematologic patients,16 as a consequence of systemic antibiotic treatment. Six of the patients analyzed with invasive aspergillosis had a concomitant bacterial infection and were on broad spectrum antibiotics at the time of diagnosis. Another patient had a cytomegalovirus infection in addition to aspergillosis and was on ganciclovir treatment. Another option is combined treatment with voriconazole and caspofungin, which may have synergistic effects against Aspergillus. Better survival rates from the combined treatment have been reported than with voriconazole alone.24 With any kind of antifungal treatment used, the cure rate depends on how early treatment is initiated.25 In addition, antifungal susceptibility of aspergillus is not available in most centers, so is not expected to guide therapy. In our series, the infection resolved in 4 of the 7 patients: 2 treated with amphotericin, 1 with voriconazole and 1 with a combination of voriconazole and caspofungin. These patients were treated for at least 1 month. Three patients died, all in intensive care, and their deaths were multifactorial. Two were on additional immunosuppression and had a late diagnosis with treatment only just initiated. Our series survival rate was 57%, which is better than previously reported,6,25 but the low number of cases makes this difficult to assess.26 The high rates of mortality and graft loss because of fungal infections means early diagnosis and treatment are required to raise the likelihood of survival in immunosuppressed patients. However, early diagnosis remains difficult, and by the time a diagnosis is confirmed, the patient may die despite antifungal therapy. The study has many limitations. These include all the expected limitations of retrospective studies, as well the fact the study spanned 34 years, with changes in surgical techniques, immunosuppressive regimens, diagnostic methods for invasive aspergillosis, antifungal treatment options and supportive care. In conclusion, Aspergillus infection remains an issue of concern for physicians who care for kidney transplant patients. Early detection and proper therapy are important in improving survival and reducing mortality. To improve prognosis, a high index of suspicion is necessary for KT recipients. Suitable empiric therapy requires accurate information about colonization and the antifungal susceptibility of the isolated organisms. The poor prognosis associated with invasive aspergillosis in immunocompromised patients can be improved by enhanced awareness, diagnosis, and therapy. Nampoory MR, Khan ZU, Johny KV, et al. Invasive fungal infections in renal transplant recipients. J Infect. 1996;33(2):95-101. Badiee P, Kordbacheh P, Alborzi A, Zeini F, Mirhendy H, Mahmoody M. Fungal infections in solid organ recipients. Exp Clin Transplant. 2005;3(2):385-389. Alangaden GJ, Thyagarajan R, Gruber SA, et al. Infectious complications after kidney transplantation: current epidemiology and associated risk factors. Clin Transplant. 2006;20(4):401-409. Ergin F, Arslan H, Azap A, Demirhan B, Karakayali H, Haberal M. Invasive aspergillosis in solid-organ transplantation: report of eight cases and review of the literature. Transpl Int. 2003;16(4):280-286. Morgan J, Wannemuehler KA, Marr KA, et al. Incidence of invasive aspergillosis following hematopoietic stem cell and solid organ transplantation: interim results of a prospective multicenter surveillance program. Med Mycol. 2005;43(suppl 1):S49-S58. Lin SJ, Schranz J, Teutsch SM. Aspergillosis case-fatality rate: systematic review of the literature. Clin Infect Dis. 2001;32(3):358-366. Tharayil John G, Shankar V, Talaulikar G, et al. Epidemiology of systemic mycoses among renal-transplant recipients in India. Transplantation. 2003;75(9):1544-1551. Abbott KC, Hypolite I, Poropatich RK, et al. Hospitalizations for fungal infections after renal transplantation in the United States. Transpl Infect Dis. 2001;3(4):203-211. Panackal AA, Dahlman A, Keil KT, et al. Outbreak of invasive aspergillosis among renal transplant recipients. Transplantation. 2003;75(7):1050-1053. De Pauw B, Walsh TJ, Donnelly JP, et al. Revised definitions of invasive fungal disease from the European Organization for Research and Treatment of Cancer/Invasive Fungal Infections Cooperative Group and the National Institute of Allergy and Infectious Diseases Mycoses Study Group (EORTC/MSG) Consensus Group. Clin Infect Dis. 2008;46(12):1813-1821. Pappas PG, Alexander BD, Andes DR, et al. Invasive fungal infections among organ transplant recipients: results of the Transplant-Associated Infection Surveillance Network (TRANSNET). Clin Infect Dis. 2010;50(8):1101-1111. Neofytos D, Fishman JA, Horn D, et al. Epidemiology and outcome of invasive fungal infections in solid organ transplant recipients. Transpl Infect Dis. 2010;12(3):220-229. San Juan R, Aguado JM, Lumbreras C, et al. Incidence, clinical characteristics and risk factors of late infection in solid organ transplant recipients: data from the RESITRA study group. Am J Transplant. 2007;7(4):964-971. Bodro M, Sabé N, Gomila A, et al. Risk factors, clinical characteristics, and outcomes of invasive fungal infections in solid organ transplant recipients. Transplant Proc. 2012;44(9):2682-2685. Park SY, Kim SH, Choi SH, et al. Clinical and radiological features of invasive pulmonary aspergillosis in transplant recipients and neutropenic patients. Transpl Infect Dis. 2010;12(4):309-315. Sun HY, Wagener MM, Singh N. Cryptococcosis in solid-organ, hematopoietic stem cell, and tissue transplant recipients: evidence-based evolving trends. Clin Infect Dis. 2009;48(11):1566-1576. Oner-Eyüboðlu F, Karacan O, Akçay S, Arslan H, Demirhan B, Haberal M. Invasive pulmonary fungal infections in solid organ transplant recipients: a four-year review. Transplant Proc. 2003;35(7):2689-2691. Ozcan D, Güleç AT, Haberal M. Multiple subcutaneous nodules leading to the diagnosis of pulmonary aspergillosis in a renal transplant recipient. Clin Transplant. 2008;22(1):120-123. Carlini A, Angelini D, Burrows L, De Quirico G, Antonelli A. Cerebral aspergillosis: long term efficacy and safety of liposomal amphotericin B in kidney transplant. Nephrol Dial Transplant. 1998;13(10):2659-2661. Herbrecht R, Denning DW, Patterson TF, et al. Voriconazole versus amphotericin B for primary therapy of invasive aspergillosis. N Engl J Med. 2002 8;347(6):408-415. Veroux M, Corona D, Gagliano M, et al. Voriconazole in the treatment of invasive aspergillosis in kidney transplant recipients. Transplant Proc. 2007;39(6):1838-1840. Tintillier M, Kirch L, Goffin E, Cuvelier C, Pochet JM. Interaction between voriconazole and tacrolimus in a kidney-transplanted patient. Nephrol Dial Transplant. 2005;20(3):664-665. Marr KA, Boeckh M, Carter RA, Kim HW, Corey L. Combination antifungal therapy for invasive aspergillosis. Clin Infect Dis. 2004;39(6):797-802. Maschmeyer G, Ruhnke M. Update on antifungal treatment of invasive Candida and Aspergillus infections. Mycoses. 2004;47(7):263-276. Ju MK, Joo DJ, Kim SJ, et al. Invasive pulmonary aspergillosis after solid organ transplantation: diagnosis and treatment based on 28 years of transplantation experience. Transplant Proc. 2009;41(1):375-8. Marjani M, Tabarsi P, Najafizadeh K, et al. Pulmonary aspergillosis in solid organ transplant patients: a report from Iran. Transplant Proc. 2008;40(10):3663-3667. Acknowledgements: There was no support for this study, and the authors have no conflicts of interest.